I remember when I was younger, and had read so much about Great Lash that was complimentary, I asked one of my Canadian cousins to bring me one when they came to visit. So disappointed, worst mascara EVER. So glad to have lots of fabulous blogs to give real and accurate reviews that magazine recommendations are no longer needed! 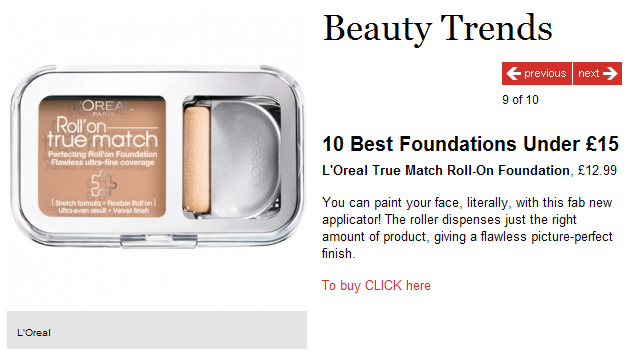 haha love it – we all know how great roll on foundation is – i wouldnt call it flawless though! I didn’t know that retro had been redefined to mean cheap. Btw, hahahahaha@the second one. You poor stripy faced girl. You mean you don’t like crap mascara and foundation that makes you feel like a mini painter and decorator haha! How shocking! The first time i saw the roll on foundation, I decided it was aridiculou idea. I mean, who wants to feel like a wall? I spend enough of my time walking into them! Hahaha ain’t that the truth. Great Lash is the worst mascara I have ever used. And as for the foundation – noooooo. 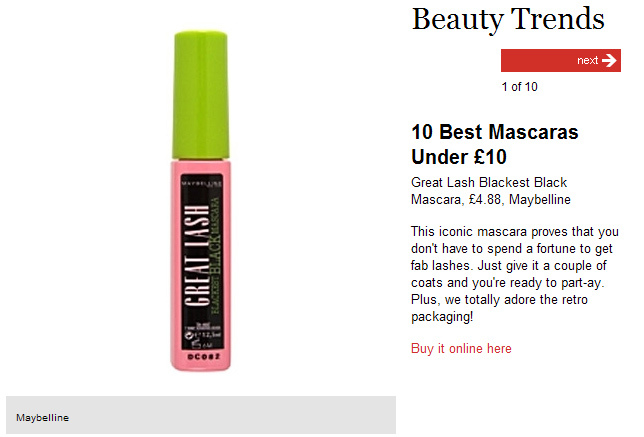 Great Lash has been the ‘Best mascara’ since I was a teenager. At least 10 years! Maybelline must be paying a lot of money to get this sort of hype written about such a rubbish product. At the end of the day consumers vote with their wallets and I know I have bought this once. Never again! I much prefer the feedback from real people! i study magazine publishing. i said nothing, shh! I fell for the Great Lash hype when I was a young and naive 17 year old. It truly is the worst mascara ever. I caved in and bought the Great Lash Waterproof over there in UK and boy, am I disappointed! It is smudging like there’s no tomorrow on me right now and it is in the name of TRAGEDY that I keep in on! OK, removing it now. It looks terrible. Paaaaa. When do you think they’ll realise thate everyone is cottoning on? I totally agree! i don’t have an issue with mass market cosmetics, just crappy ones however much they cost!! P.S. What day are you going to IMATS? I’m going the 31st. Absolutely agree! I laughed when I saw that roller foundation paint thing in my magazine. ha ha – glad I’m not the only one who a)bought great lash and found it to be utter crap and b)thought that foundation looked like something i wouldn’t touch with a barge pole! lol..good topic to bring up! i so know what you mean..!! That foundation however… I don’t even understand it. But I do NOT understand how Great Lash continues to win awards. Unless it’s like – people refuse to try other, more expensive mascaras? Because it is pretty much the cheapest one out there. Haha, that picture really says it all. The beauty sections in fashion- or womens magazines are the biggest joke ever. Ermmmm…. i actually like the great lash mascara (hides face in shame)…Seriously, i’ve never had a problem with it, and if i’m too skint to buy Diorshow or 2000 cal then that’s what i’d go for. That foundationg does seem ridiculous though. All about advertorial. It’s hard to take editorial outlets seriously when they feature the same things year in and out, regardless of what their readers are telling them. Ad dollars clearly pay more than subscription fees, don’t they?! Hmm I really like L’oreal Telescopic and for some reason Great Lash BIG (that’s the one i tried) works really ok on me. Maybe it’s coz I’m asian and have black lashes to begin with? Or maybe my Lashes aren’t that full to begin with so I don’t get clumpy or anything. Redtiger21 I totally agree with you Great Lash is good. I mean you can’t expect it to be perfect for the cheap price. But i have to admit the foundation makes me squirm. What are you talking about? Roll on foundation is the best!